This outdoor living room was built for Erika and Matt Benz of Bellaire, Texas. 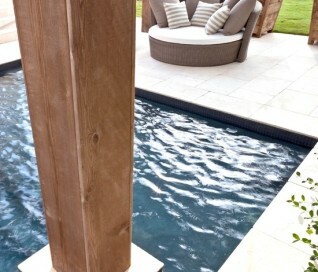 It is constructed in the form a large arbor that shelters one end of the pool from direct sunlight. 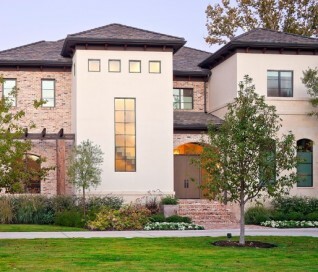 The architect recommended Exterior Worlds for this project due to a special request on the part of the homeowners. 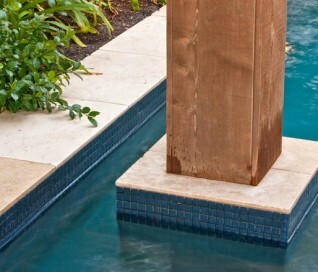 Mr. Benz requested shade as one of his major requirements for the pool design. 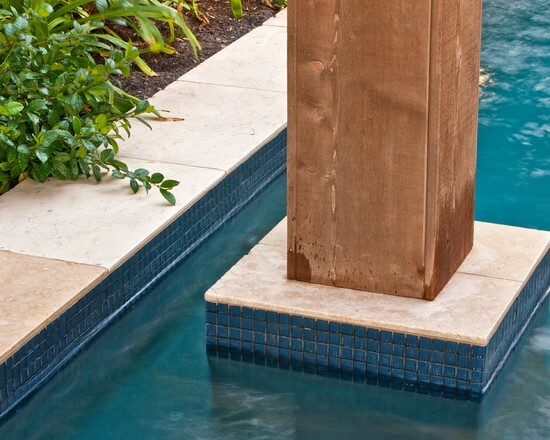 The shaded outdoor space, which extends considerably over one end of the water and swimming pool deck, allows him to enjoy the outdoors without discomfort. The arbor is built of cedar and was designed to mirror a preexisting arbor that was already standing in the front yard when we arrived. 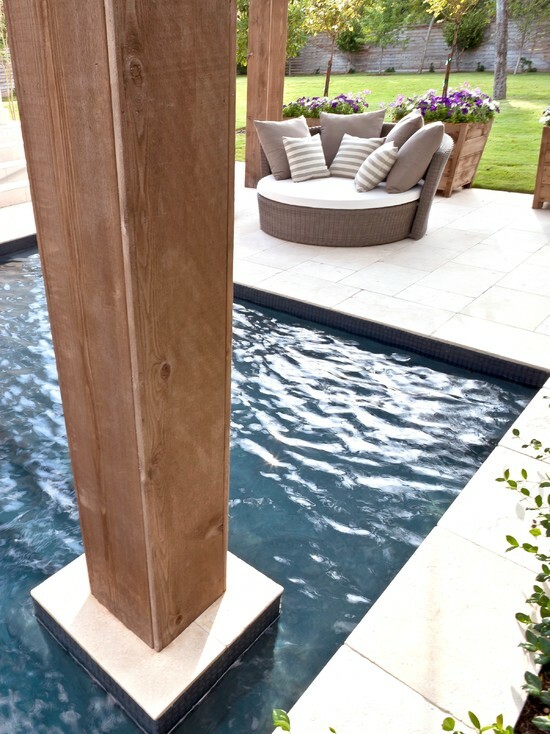 It also matches the columned architecture of the back of the house, extending it over the pool with the delicate formality of an outdoor living room built for quiet and comfort. The roof of the structure is composed of a sunscreen that filters out 80 percent of the light—cooling the interior to a comfortable level even on the hottest days of August. 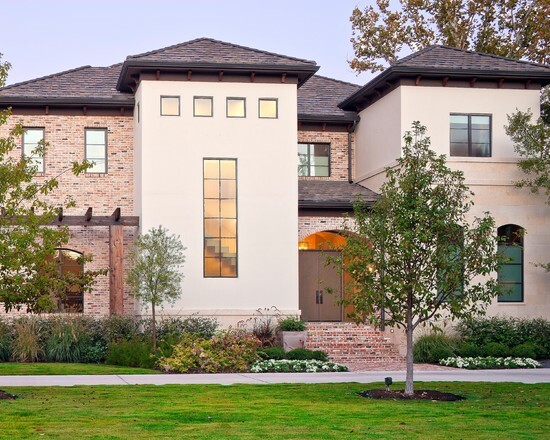 One of the reasons the architect recommended us was because of the unique challenges associated with building a structure like this on the floodplain of Bellaire. Homes here are built off the ground to minimize the risk of water damage. The pool was subsequently much lower in relationship to the house than it normally would be. If the arbor had been constructed at a conventional height, viewers in the home would have been looking down on the roof of the lounge area, which would significantly detract from its aesthetic. In order to overcome this challenge and strike a balance between the various elements, we built the outdoor living room 12 feet higher in elevation. This causes it to appear relative with the rear of the house and preserves the symmetry of the architecture. In formal landscapes, columns always create something of a classic sensibility reminiscent of Greco-Roman landscapes. This hint of classicism is reinforced in this project by various plantings that were integrated into the landscape design. The most notable of these is the row of holly trees that runs alongside of the pool. When illuminated at night, they draw the eye away from the back of the house so that the viewer’s gaze is centered on the lounge area of the outdoor living room. Both the area around the pool deck and the property at large is further enhanced by various ground covers that include agapanthus, rusellia, adagio, zoysia grasses, an herb garden in the motor court, and sandy leaf big vine. Various landscape lights were then installed in key locations throughout the softscape and around the home. The front of the home was illuminated to make the entire property stand out, and moonlighting was added to the back to add a touch of mystique to the scene. The outdoor living room itself is illuminated by warm incandescent tones that are reminiscent of lights in home interiors. Internally wired to a time clock, they turn themselves on and off every evening and following morning. This allows Mr. Benz to lounge by the water anytime day or night, or to comfortably sit in the shaded end of the pool on even the hottest of afternoons.